The following are exerts from early Claiborne County Newspapers. Married Maggie Shell daughter of William Shell to Jefferson Ely, Apr 1888. Claiborne County Democrate Vol. 1 Tazewell, Tenn Wed. Oct 5, 1892. Mrs. J H. Carr the wife of our worthy friend, J. H. Carr of Old Town was in town last week visiting her daughter, Mrs. E.A. Hurst, accompanied by her son and duaughter Jammie and Mrs. Della. The Tazewell Times Vol 1 Tazewell, Claiborne Co., TN Wed. 12/23/1896 - Local Dots. Miss Maggie Hodges, went to Lone Mt. Wednesday last to visit her sister, Mrs. James Day. Mrs. Mollie Yoakum of Lone Mt. and Miss Sallie Carroll of Knox Co. were visiting the Miss Stones of this place this week. Mrs. William Chumley visited friends and realitives last week at Cumberland Gap. George Livesay Commission Merchant, New Tazewell, TN Cash paid for chickens, eggs, geese, ducks and livestock. People wishing prices, etc. can get message over the telephone at my expense. Oct 7-1. New Tazewell Times - George Livesay, Editor and Proprietor .50 a year. George Livesay called Tazewell about Springs village, Grand Old Republican Party. Miss Rosa Payne and Mattie Livesay went down the country the other day to enjoy the country air. What countless and magnificent escapes even the best of us in our short career and what fatalities we clutch which we should have shuned with horror. And how easy it is now to look back on our lost battlefields that might have been victorys had we stopped to read the grim lesson of experience, the threatening danger that stared us in the face at every turn in life when prosperity had been blighted and pledges had been broken and promises had been forgotten. All because we fainted under the banner of King Credit, but now have come again with the bullion, the stuff that will buy the world, with goods that is unexcelled in quality, and with prices that will prove to you that the Almighty Dollar is King of the World. And thanks to my many friends, I will prove to you if you will visit me and examine my goods, that I am on top. I will pay you cash for your produce and will redeam every pledge I have made to living man, and will continue to condemn without fear, thievery, robbery, corruption and dishonesty in the future as I have in the past. (Edith LIVESAY, who married Tom Ed STONE had not been born)Picture made about 1902-03. George Livesay's daughter, Mattie Alice Livesay, married Judge Lafayette Glen Payne and remained married to him until his death in 1924. As a special request to my brother Robert T. (Phil) Payne I have decided to study my grandmother Payne's marriage to Daniel C. Yoakum, son of James R. Yoakum. He was mistaken in his assumption that this marriage took place after my Grandfather Lafayette G. Payne died in 1924. Here is some proof. In the 1900 Claiborne County census the following is found. Mattie aged 16, born Jun 1884 -- both born TN"
Who was this Mattie above? Robert W. Payne had already married Mattie Mason and is listed in the 1900 Census, below. Mattie Alice Livesay - who latter married L.G. 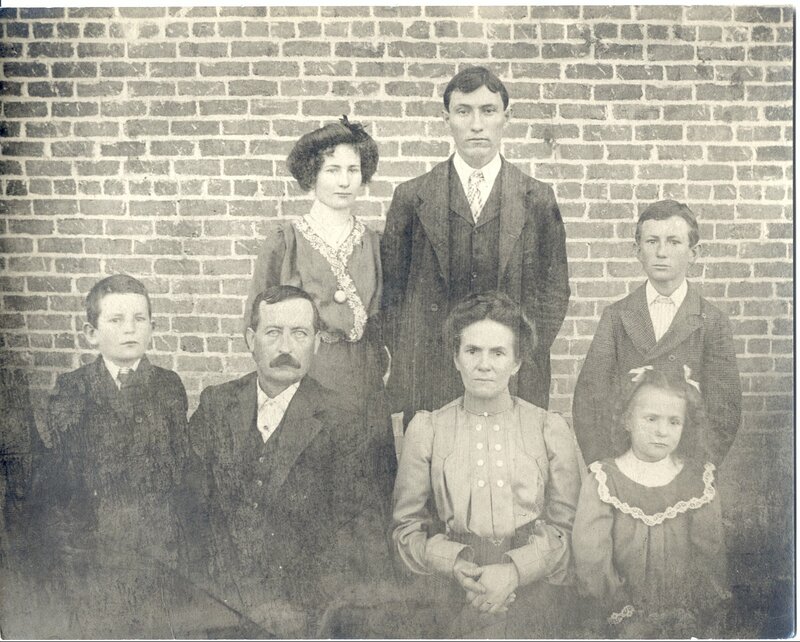 Payne is not listed anywhere in any 1900 Census as well as her father George Livesay with siblings. As you can see by the announcement above George Livesay was not happy with living in Claiborne County. Daniel C. Yoakum was the Federal Census taker in 1900 and is living with his grandmother, a sister as well as this 16 year old "Mattie". James R. Yoakum, Daniel C. Yoakum's father, did not have a daughter named Mattie. So who is she? Enumerated 9 June 1900 by Daniel C. Yoakum. All white, speak English. "1910 census District 3, Claiborne, TN: Daniel Cawood Yoakum, aged 33, occupation not clear, bp TN, both parents TN; Lettie (Rose Breeding) aged 23, married five years, one child, bp TN, both parents TN; Shelby Cawood aged 3, bp TN"
It is told me that Daniel Cawood was not good to Mattie Livesay and that her father George Livesay had the marriage annuled. Shelby Cawood Yoakum later had a brother Glenn Samuel Yoakum born 1913, most know him from the Claiborne County now Century Banking family. After my grandfather's first wife died he married Mattie Livesay in November 1901. During a visit with Leo Walker Yoakum around 2001 and after receiving an email <SEE BELOW> from the grandaughter of Shelby Cawood Yoakum I was able to reunite by phone the widow of Glenn Samuel Yaokum, Leo Walker Yoakum and daughter Glenna Rose Yoakum with family they hadn't seen or heard from in years. That made me and them very happy. George Livesay had previously been Editor of the Cumberland Gap Progress but had left that paper to form his own in New Tazewell. I was not mistaken when I spoke of the building that housed the telephone exchange in New Tazewell as being the building directly across the street from Payne Motor Company, the George Cosby & Sons Building. My uncle recalled it to me as the building where Western Auto had it's building only. I think that the Western Auto has been a couple of places in New Tazewell but the first was the George Cosby building which had been purchased by the Cawood brothers and that is where I thought my Uncle L.G. Payne was referring. there the rest of his life. Please follow the link below to see excerpts from the Knoxville Business Directory regarding the Livesay Produce Store. My name is Nancy Urban and I live in Signal Mountain, TN. I am trying to find a starting place for my son-in-law Steven Scott Yoakum. information about his father's family. His father died in 1991. James Butler Yoakum (Steve's Dad) had polio as a child. Primitive Baptist Church (evidently flooded by TVA). Shelby had a check from the government for 5 cents compensation. Tuscumbia, Colbert Co, AL. Annette Yoakum m Lloyd Wilman. Glen L Yoakum. James M. Yoakum 5/19/1908 - 10/09/1995, Claiborne Co, TN m Myrtle. Shelby Cawood Yoakum (Steve's grandfather) m Artie Juanita Butler. Children:  James Butler Yoakum (Steve's father) and Jack C. Yoakum. It would mean so much to Steve if I could find his family.